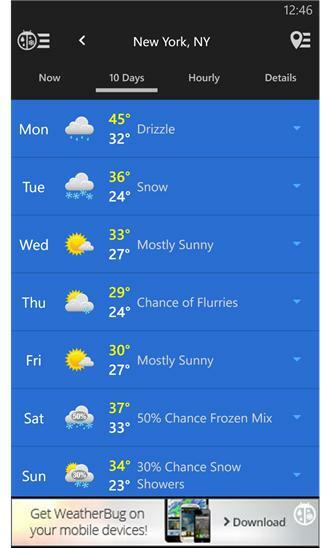 Download WeatherBug to Know Before™. Access the world’s largest network of real-time weather and lightning sensors for the best forecasts and the fastest alerts. 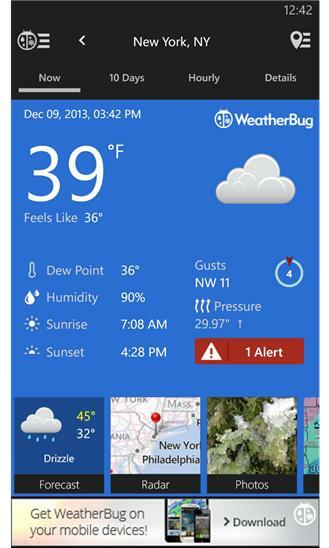 Stay safer with WeatherBug! Only our data is real-time, which allows us to see weather threats first, provide better forecasts and give the fastest alerts to severe weather! And only we measure “Total Lightning” so you get exclusive Spark lightning proximity alerts for your current and saved locations. Know Before™ with these unique features: • NEW Spark Alerts – Unique and beautiful, Spark turns your smartphone into a personal lightning detector. Get real-time, minute-by-minute, mile-by-mile lightning monitoring from the WeatherBug Total Lightning Network. Now redesigned with a live lightning map to show you lightning strikes near you and across the world! • Real-Time Enhanced Pin-Point Forecasts for 2.6 Million Locations Worldwide – The industry’s most accurate current, extended and hourly weather forecasts for your neighborhood and beyond. With 25% more accurate forecasts for the next 24 hours (when compared to other weather apps), Know Before™ you head out! • Extended 10-Day Forecast – Weather happens. Get the most accurate extended forecast and Know Before™ 10 days ahead. • Exclusive DTAs & Severe Weather Alerts – Minutes Matter. Our Dangerous Thunderstorm Alerts (DTAs) provide you 50% faster warnings to severe weather than the competition. Plus, you get National Weather Service (NWS) warnings and watches to stay informed of severe weather conditions at all your current and saved locations. • Enhanced Interactive Maps – Enjoy our enhanced maps with multiple layers such as Doppler radar, humidity, pressure, wind speed, high/low forecast, satellite imaging and more! • Live Weather Cams – View live images from over 2,000 weather cameras across the U.S. to get a better picture (pun intended) of the weather at destinations near and far. ...and more!